Pictures of the Olympus E-P1 have appeared on the internet, showing off a camera with a distinctly old-school look. It may have a rangefinder feel to it, but underneath the retro chassis is Olympus' revered Micro Four Thirds technology, which brings DSL capabilities to the most compact of cameras. Specs haven't been leaked as far as TechRadar can gather, but the rumour mill has churned out the following details: the body is 120 x 70 x 35mm; raw images can be snapped at 13MP; and at the rear is a nifty 3-inch LCD. The camera is said to also feature 11-point autofocus, ISO 6400 sensitivity and will even pipe out 720p video to SD card. The Olympus E-P1 is all set to ship to retailers this July for around $900. There's no confirmation if and when the camera will see the light of day in the UK. 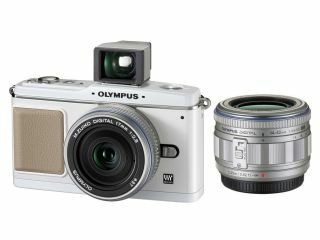 If you check out the Olympus' Hong Kong website, it looks as if the camera is in homage to the company's Pen F range – and could well tie in with the 50th anniversary of the snapper. Either way, it looks like a thing of beauty to us. Olympus has confirmed that the E-P1 is coming out in the UK and it is available in July, with prices starting from £699 (complete with 14-42mm zoom lens kit). If you want to spend a bit more you can fork out £749 for the camera and a 17mm pancake lens and viewfinder. Find out more by pointing your browser to www.olympus.co.uk.